I have been following Piggy of Piggy's Cooking Journal for many years now come to think of it. 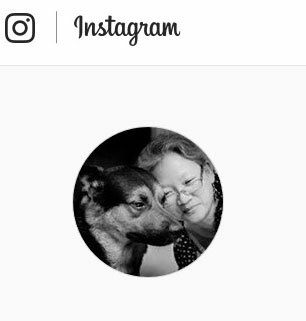 I love most of the recipes she so generously shares on her beautiful blog and not to forget mentioning the beautiful photos of the bakes and dishes she prepared. Her food presentation is so alluring that I fell head over heels with this particular one that I had to make it fast and I can't wait for her to post a new one so that I would not steal her show :p Thanks Piggy ( we almost belong to the same clan ) for sharing this recipe with me. This cake is so good that Wild Boar ate more that he is supposed to eat. Love it and I shall make this again when the Piggies are back for the sem break :) The texture is so good...moist and yet light, richly flavored by the red wine sauce....mmmmmmm yummy ! One word one....SPEECHLESS ! 1) In a saucepan, combine red wine, water, pears and cinnamon. Let it simmer for 20 minutes. Remove the pears, add 1/2 cup of castor sugar to the saucepan and boil the syrup for 15-20 minutes. In the mean time, halves and cores the pears. 2) Preheat the oven to 180 deg C. Lightly grease and line a 12-cm round cake pan with baking paper. 3) Mix flour, almond meal, ground ginger and mixed spice in a bowl. Set aside. 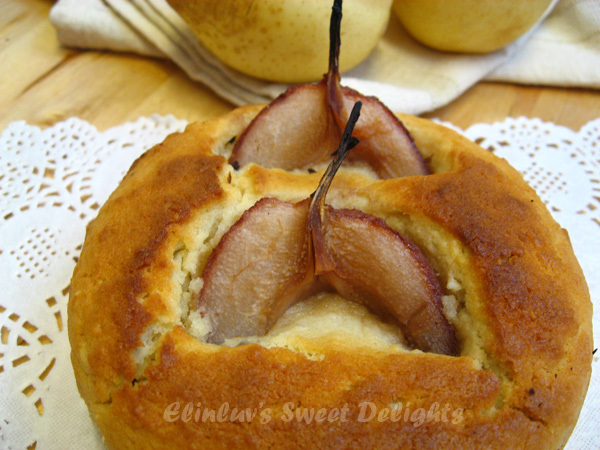 4) Using an electric mixer, mix butter and brown sugar in a medium bowl until light and fluffy. Beat in egg. Fold in flour mixture, following by milk and yogurt, mix until well combined. 5) Spoon the batter into the cake pan and smooth the surface. 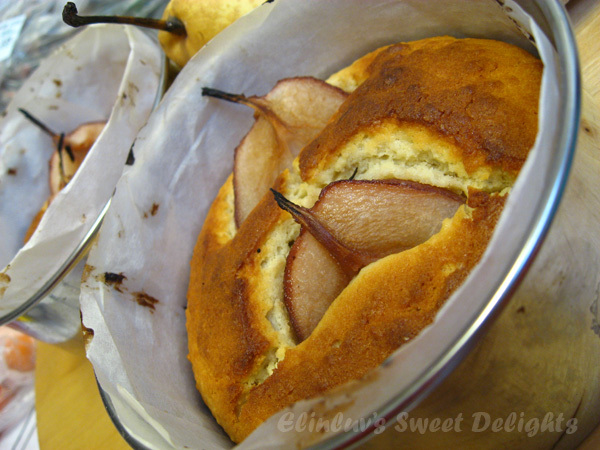 Press the base of the pear halves into the cake mixture, standing them upright. 6) Bake in preheated oven for 40-45 minutes until a skewer inserted into the centre comes out clean. Drizzle the cake with red wine syrup. Serve. Is interesting to slot in the halve pear in cake! 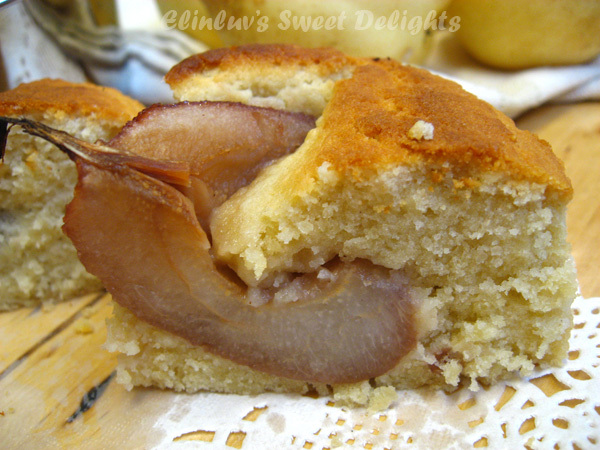 This cake must be delicious with the red wine pear in it! 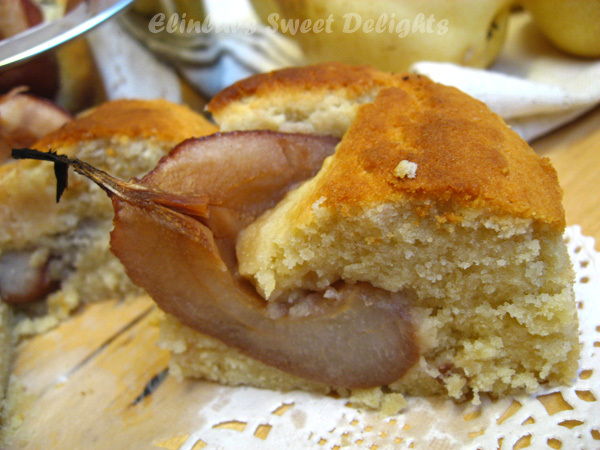 This is a brilliant idea to enhance the flavor of the pears in a simple cake...very nice! 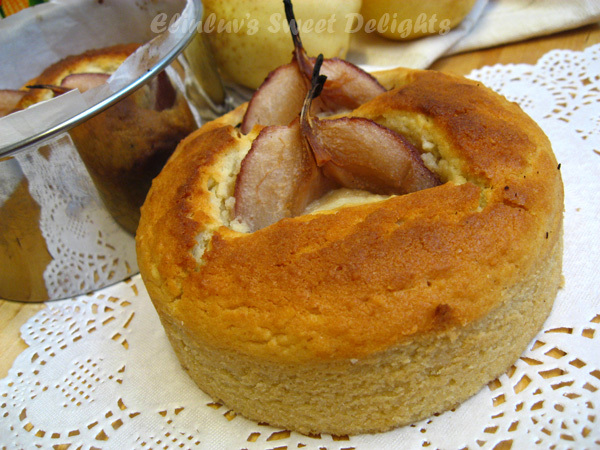 This is an incredible cake and the half pear in side is amazing! Really, nicely done! buzzed! can get high or not eating this cake?? LOL! Momsie, these cakes are so cute, especially with the pears sticking out. Would be very appropriate as giveaway for the festive season. What a lovely idea! The cake is just gorgeous and i bet it tasted delicious! Beautiful presentation to accompany what must be wonderful flavor. Wow, this looks good! The texture of the cake looks really moist and soft! Thanks for sharing! Oh Elin, I was also thinking of making this cake too. Looks so yummy must try them soon. This looks incredible. 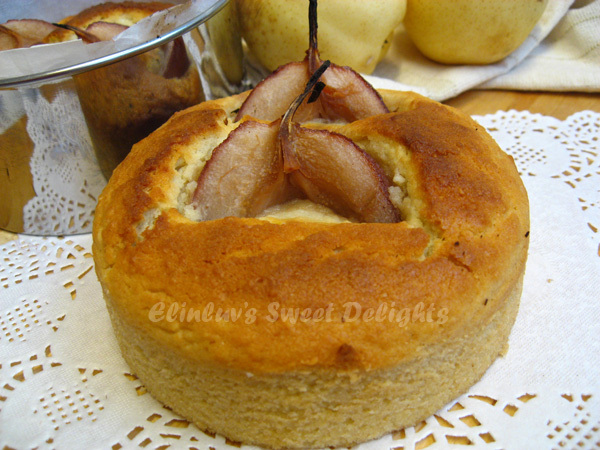 I've had several kinds of poached pears and pear cakes but this is an original twist. 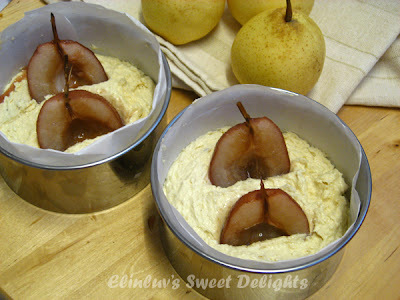 I like the idea of slotting in the pears like that. Save a lot of time slicing them. Looks delicious! Veron...haha yea save work *wink . yes it is yummilicious ! Chicken Pie With Delectable Pastry !